This Biogas module provides reasonable expectations for investing in on-farm bio-digesters to convert animal waste to process heat and/or electricity. Learn how to calculate the number of animals needed to build a cost effective system. Anaerobic Digesters and Methane Production… Questions that need to be asked and answered before investing your money. Discovery Farms, University of Wisconsin-Extension publication A3766 (2001). A Digester for the 125 Cow Dairy: Fact or Fiction? Presentation at Midwest Manure Summit (2010); M. Charles Gould, Michigan State University-Extension. 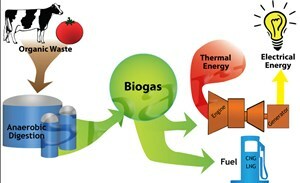 Energy Yields from a Farm-Based Anaerobic Digestion System; Ontario Ministry of Agriculture, Food and Rural Affairs. Infosheet gives the basic information required to calculate the type, amount and economic value of energy that could be expected to be produced from a farm-based anaerobic digestion system. It also provides an example of an energy balance for a digester. Module Author: Ed Johnstonbaugh provides extension programs for Penn State in renewables and “smart energy buying and use”, including an energy credit co-op and other energy programs. He has over 25 years of experience with utility companies in the energy industry.